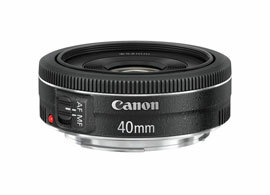 The new Canon EF 40mm f/2.8 lens is the second one that Canon has equipped with its new Stepping Motor Technology (STM) system that allows that allows not just fingertip editing, but also the ability to provide continuous tracking of moving objects both rapidly and quietly, making it perfectly able to answer the exigencies of video. According to Canon, this type of motor eliminates the “pump effect” that one sometimes encounters with other systems. Videographers will particularly appreciate its quietness, along with its electro-magnetic diaphragm (EMD) that allows for accurate and swift shutter control. The shutter consists of 7 circular leaves. Its optical formula integrates an aspherical lens element that has been treated with a Canon Super Spectra coating. Available at the end of June 2012 with the trans-standard EF-18-135mm STM, the EF 40mm f/2.8 STM pancake will be offered at a price of 279 € (tax included).